Inflatable Bed Air Pump is a cordless rechargeable air pump. Simply plug in the unit at home. Charge up the built in battery. Then it works off the stored power to blow up your inflatables. Makes an ideal companion to inflatable beds or mattresses. Also ideal for inflating dingies, inflatable furniture, toys, swimming aids and paddling pools. The Inflatable Bed Air Pump comes with four pressure nozzles to use on different fittings. 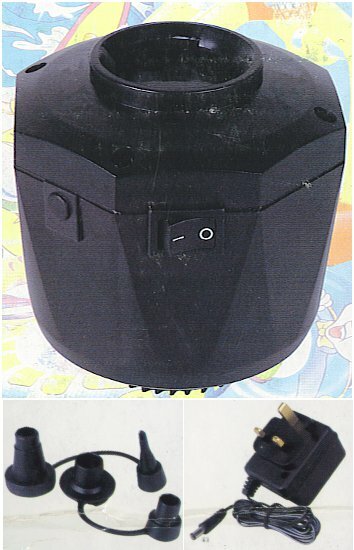 There`s a free 240v adapter included for the cordless rechargeable air pump to recharge using UK electricity. Inflatable Bed Air Pump text, images and video are copyright.